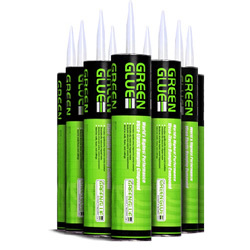 Green Glue is a liquid, waterborne, viscoelastic damping compound which represents the highest performance product of it\'s type. We are aware of no product available to the construction market which can deliver damping levels even 30% as high as those offered by Green Glue. It is also significantly lower in applied cost than competitive products, getting a better cost/performance ratio in the damping of normal construction materials such as drywall, wood products, etc. Finally, it is remarkably tolerant to real-world application conditions and carries almost none of the burden of precision required by many damping systems. The ideal coverage should be uniform throughout the sheet using 1 - 3 tubes. Applying 1 tube of Green Glue per 4’ x 8’ sheet will deliver about 70% of the performance of 2 tubes. Three tubes is optimal per 4’ x 8’ sheet will improve low-frequency performance around the primary resonance. We do not recommend using more than 3 tubes per sheet. If you use too much Green Glue, performance will decline.